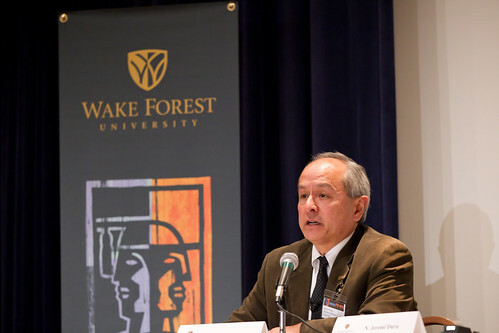 Leslie E. Wong, the president of Northern Michigan University, discusses coaching opportunities in college and professional sports at the Losing to Win Conference at Wake Forest University on April 13, 2011. Photo courtesy of Wake Forest University News Center. Dr. Leslie Wong is trading the snowy winters of the northern Michigan peninsula for the foggy summers of San Francisco as the incoming president of SF State. Wong, 62, who prefers to be called Les, has served as president of Northern Michigan University since 2004, and was originally drawn to San Francisco because of its progressive reputation. Wong, a Bay Area native who grew up in Oakland, is known on his current campus for his accessibility, having taken part in student-run theater productions and going out of his way to hear from the campus community, according to NMU spokeswoman Cindy Paavola. The announcement was made after a closed meeting Monday of the California State University Board of Trustees, which was responsible for selecting the new president after a search committee narrowed the candidate pool down to three. Although NMU only has an enrollment of 9,400 students, Wong feels his time there prepared him well for his position at SF State, which boasts an enrollment of more than 30,000. Although the size of the campuses differ greatly, California and Michigan are similar in that both states have suffered financially during the economic downturn. One of Wong’s main focuses at NMU has been the implementation of technology on campus, with a 4G WiMAX network that is owned and operated by the university, which not only covers the school, but also 40 square miles of the town surrounding it. Coming in as the successor of Robert A. Corrigan, who has served as the campus president for the last 24 years, Wong knows that he has big shoes to fill, but is looking forward to the task.